If this is successful - and the early indications are positive - the probe will later return to gather samples from the gouged depression. Because of the debris that would have been thrown up in this event, Hayabusa-2 manoeuvred itself before the detonation to the far side of 800m-wide Ryugu - out of harm's way and out of sight. Bombardment with cosmic radiation over the aeons is thought to alter the surfaces of these planetary building blocks. So, scientists want to get at a fresh sample that hasn't been changed by this process. 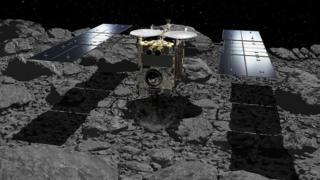 Ryugu belongs to a particularly primitive type of space rock known as a C-type asteroid. It's a relic left over from the early days of our Solar System, and therefore records the conditions and chemistry of that time - some 4.5 billion years ago. Speaking at last month's 50th Lunar and Planetary Science Conference (LPSC), project scientist Sei-ichiro Watanabe said the experiment would also "provide us with information of the strength of the surface layer of Ryugu". This could help shed light on how the asteroid developed its characteristic "spinning top" shape. At the LPSC meeting, held in The Woodlands in Texas, Yuichi Tsuda, the mission's project manager, told me how the team decided where on Ryugu to generate the artificial crater. "There are two things: the first priority is to make a hole where we can easily identify a crater... so, easy observation, not too hard, not too bumpy," he said. "Second, somewhere that's as feasible as possible in terms of landing... if those two don't meet together, we go with the first priority."